Most homeowners don’t realize just how precious their plumbing is until it stops working. While unexpected plumbing emergencies do happen, a lot of plumbing problems can be easily prevented. 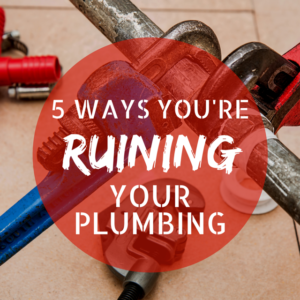 Check out these 5 ways you’re ruining your plumbing…without even knowing it! Are you guilty of these ways you’re ruining your plumbing? 1. Putting everything in your garbage disposal – It’s important to remember that garbage disposals aren’t a cure all for your food-related waste. Keep out certain things such as fibrous food peels and eggs shells as well as flour and rice that can gunk up the disposal and clog your drain. 2. Leaving the hose connected during the winter – When you leave the hose connected to the outdoor faucet all year, you risk the faucet and even the water supply pipe, to freeze. Don’t take the risk and disconnect the hose. 3. Flushing the un-flushable – Flushing un-flushable items can block the main drain in your house. That leads to ultimately halting all plumbing – and no one wants that. 4. Tackling plumbing repairs yourself – Despite what some may think, plumbing is complex. Trying to tackle blocked drains, leaking pipes, or water heater pressure on your own will likely lead to bigger (more expensive) problems. 5. Using chemicals in your drains – Using chemicals in your drains can potentially cause two problems: 1) using bleach and other anti-bacterial chemicals in your drain, you are stopping the helpful microbes that eat away your sewage in your septic system. 2) it can ruin your pipes and eventually eat them away. If you’re guilty of doing any of the above things, there’s no need to worry. Now you know how to better care for your plumbing! However, if you do experience drain blockages or pipe problems, contact the trenchless pros at TRS today! In fact, you may even qualify for a free camera inspection – normally a $300 value. Contact us today!